"Am I a craft hoarder?" If you have to ask yourself that little question, chances are you may be. Let's find out together! We've assembled a quiz to help you find out exactly where you rank! It's time to get our your paper and pencil so you can jot down your answers! 1. You redeem more coupons for crafting than you do for grocery shopping. a. All the time, I never miss my chance to get 40% off. b. Only during peak crafting season. c. Craft coupons? What craft coupons? 2. You have dozens of bottles of paints that are solidified, what do you do with them? a. Save them! I'll add a bit of water and bring them back to life. b. Look for any that are salvadgable, toss the rest. c. Drive them to the nearest landfill for proper disposal. a. Still in shopping bags in the garage. b. In use, but not in any kind of order. c. Filled, filed, color coded and labeled. a. Just fine, I have a path to walk through and a 3'x3' work area that is cleared. b. Messy, but I project clean every month. c. It's ready 24/7/365 for a magazine photo shoot. a. You made $5, shut down the operation, and went shopping at other yard sales. b. Changed your mind on selling that box of random cardstock, just as someone said they wanted it. c. You sold everything, and donated the money to a local charity. 6. Your family has given you the ultimatum - "Your 500-piece glitter collection or us." a. You kiss them goodbye and tell them it's been nice. c. You dump the glitter and tell them they are all the sparkle you need in your life! a. Run to your craft room and hide said yarn so she can't get her hands on it. b. Cut off a few feet and tell her to use it wisely. c. Give her the key to your secret expensive yarn stash to do with as she pleases. 8. Your local hardware store is having a blowout sale on mason jars. a. You push away other shoppers and buy so many cases you have to get another cart. b. Grab a couple cases, they will come in handy at your cousin's wedding next year. c. Think about it, then pass on by cause you don't have a project in mind for them. a. Stay to the end to take home everyone's leftover paper, glitter, flower pedals, sequin, fabric scraps and cardboard coffee sleeves. Yes, you even pick them out of the trash bin. b. Clean up your area and choose a few select items to add to your collection. c. Ask everyone to gather unused supplies so you can donate them to your child's classroom. a. Build makeshift furniture from piles of fabric, stacks of craft magazines and boxes of rubber stamps. b. Ask them to make a project from supplies you will select for them. c. Present them with a pretty grab bag of brand-new supplies that you had already prepared for moments like this. 3 points for each a. 2 points for each b. 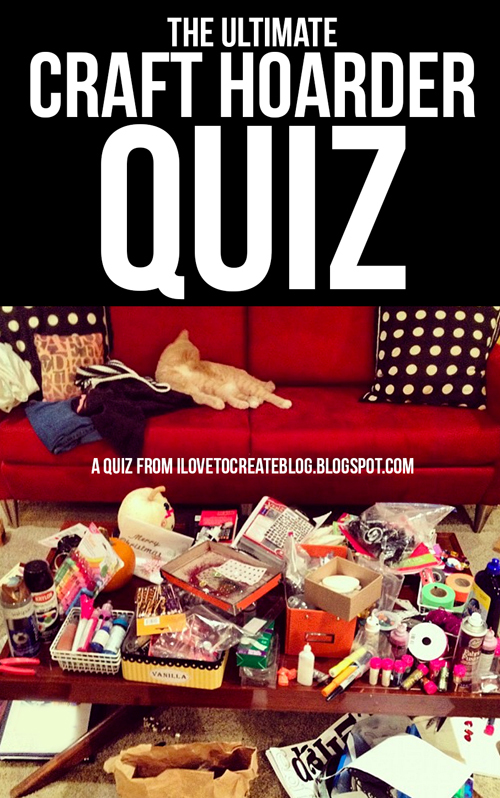 1 point for each c.
If you got 25-30 points you are...The Ultimate Craft Hoarder! If you got 16-24 points you are The Creative Mess! You are a borderline hoarder, but you are aware of that. You know how to have fun, get messy, but still keep a grip on reality (and your glue gun). If you got 10-15 points you are Little Miss Crafty Organizer! Well, aren't you the crafty saint of all things organized and pristine? We suggest you knock over a jar of glitter just so your friends don't hate you. Tell us below what your score was! We want to hear how you did! But I knew that before I took the test ! The Creative Mess. My craft area is organized until I start a project. Then I have to reorganize the area once a month by putting things back where I got them. I am a 27 and PROUD of it!!! I am a Creative Mess! And I love it!!!! Hoarder, and it is a good thing I don't know where you other hoarders live *evil laugh* Hide your stashes!!! 30. Everytime I start to clean, it's like Christmas! I don't share so some questions did not have an answer. I fell in the middle as I expected. I sadly just tossed craft items in my classroom that I hadn't used in 15+ years and could not donate to the "art parent." I have 40 year old magazine photos (loved LIFE mag) I still can't part with. Maybe this summer. Absolute craft hoarder. I don't see anything wrong with that!! I even moved to a new apartment so I could have an extra bedroom (craft room) for my collection! I'm just a crafty mess, as I have suspected. I do, however, need a much bigger craft room, a shop even, as my crafts have overtaken my home. The Creative Mess! My problem is that I teach craft classes & just drop the bag in my craft room when I get home, saying I'll put it away tomorrow...but never do. I also tend to not put supplies away after a project. But I do have many bins & they are all marked. I can go into my chaos & know just where the supplies are that I need! I was 'saved' by the skin of my teeth, I scored 24. My 'stash' has crept out of my craft room into my bedroom and is slowly making its way to the kitchen! Thanks for the laughs!. Just as i thought..I am a creative mess,and I am proud! I'm a 14, but don't judge me! I do get glitter on my face, have bins of craft supplies that make no sense, and hoard strange things like discarded food containers. A saint I ain't, but a happy crafter I am! 27! I already knew I was a craft hoarder! I even moved across country and brought my whole craft room with me! I couldn't stop laughing after reading this! Aren't we all? I got a 21 I guess i am a creative mess sounds right ! Debbie, yes I keep everything. Brought everything with me when we moved to calif. never worried me and I packed everything in all the boxes alitte at a time. My husband asked why light boxes got so heavy and I just laughed little did he know hard covered craft books were to blame. He really laughed at me when we got moved he said I knew you had something to do with this lol. So keep crafting girls great for stress too. Creative mess. And I can totally live with that! 26 but could have been higher, I'm w/Liz on #7. "Cleaning" requires inviting my hubby and a son in, Hubby to remove an item from me when I hesitate to identify where it belongs, what it was or wil be, or who it was from or to. Son to run it out and dspose of. Did this yesterday. Son and granddaughters took lots of stuff to the curb where it was promptly picked up by other crafters. I can get through my craft room and pantry (craft overflow area). I'm a Creative Mess.. well, I could have told you that. So could all my friends. And probably their friends, too. And the Township police and . . . I'm a 26 but I knew I was a hoarder. If I spent as much time scrapping as I do buy and trying to organize my supplies, I would get a lot done. Creative Mess. But I truly think that I am a hoarder. I'm a Creative Mess. I think I'm doing good; my family hates it. I am a creative mess! and darn proud of it!! HEHEHE! I am a creative mess. I am going to my craft space & try to use some of my mess to make something right now. 27 and proud of it! I told a friend today that the "crafting" line in my budget is several steps above my clothing amount. That's why I have full shelves and an outdated closet. Fine with me - I don't have to dress up to craft and I wouldn't want it any other way! Creative Mess -and only because I had a hard time deciding on some of the answers, especially the ones about friends and crafting. I knew I wasn't an ultimate hoarder but close (scored 24). My space is a mess and I will get it organized someday...maybe. I am a creative mess and love every bit of paper, every envelope, every bit of glue!!! I do donate though by making craft baskets for bizaars and various fund raisers, it is a good reason to buy more stuff! Lol! I got 22, the Creative Mess.. Definitely! I ranged in the middle of the Creative Mess, but I knew that. Creative Mess describes my craft/sewing room. I am comfortable with it, if someone has a problem with that well that's another test. am a good solid 25. Definitely a hoarder. My family gave me a sign for my craft room, "I collect art supplies". But I have fun! forget it I am buying. I got a 19.. I think it would be higher, if some of the questions were actually answers I could give myself. I know I'm a borderline craft hoarder and am proud of it but I have given away things to friends since they use said products more than I.. lol.. I'm a 24.... A very happy 24! Well 21 is what it says but I have to say I'm pretty bad when it comes to my crafting!! I never throw away anything and I'll take things apart to save for later you never know when it can be used in a project. My girls will clean there rooms out and throw things away and they know that I'm to get the bags before they throw it out. I go through it all and save everything, one earring, broken Barrett's, just about everything. I create world's and I Spy's with anything you can imagine. Cindalisa Boutique on Facebook you can see my love for crafting and creating. I moved about two years ago and my friends and family joked that I was going to need a semi to move it all. Some thought I should get rid of some of it saying your not going to have room at the new place. I laughed and I just got rid of other things because my crafts are my passion and love so it was coming with me. Love clearance and sales I never stop adding. Hope my girls will be kind to it all when it's my time and know the importance of it all, they hate all of it and don't get some things I keep but there the first to come when something is needed and they know it's a guarantee mom will have it. 21 was low I believe a true hoarder I am and proud of it!!!! Loved the test and the fun of reading all the comments. Happy crafting everyone. I am a 24! I come really close to being a hoarder! If I am not careful I may go over the edge into hoarding territory! I'm a 19. It's funny, the rest of my house can be trashed, but my studio is always organized and neat...so I can ALWAYS find what I need for a project!! 25 - I couldn't answer one because I live in the UK and we don't have craft coupons! I didn't really need to take the quiz to find I'm a craft hoarder. 24, wow, I thought I was a hoarder! I need to try harder!!! I'm a 24 until I get going. I actually have stuff stashed everywhere because I don't have a dedicated craft area, (it's the living room, bed room, spare bed room, office area in another building, storage shed) you name it it's there! 23, So at least I'm borderline and aware of my hoarding. LOL Such a cute little quiz. 23. I am a creative mess and so is my craft room. My husband corralled everything one day (it shares the tv room downstairs. )He then made me watch him draw an imaginary line and told me that anything on the other side of the line would get tossed. So far, so good. 25. I would be better but I'm in temporary housing and only can take one suite case with me when we move. I am a creative mess, but in the long run I will end up being a hoarder. Nice solid 22 ! Tend to save things forever, and salvage or scavenge on a regular basis. I find it helps to keep the creative juices flowing by having "unplanned" materials on hand. I scored a 24 so I'm a creative mess. But only because I'm running out of room to hoard! 25... In my defense my hoarding is not limited to craft supplies... That makes it better, right???? I'm a creative mess but too close to hoarder to be that comfortable about it! Lots of fun going on her - thanks! 29 I lost one point on the mother/daughter thing. My daughter says lets go to the craft store I need____________. I say no we don't need to go I have that, here let me get it for you. She says NO I want my OWN STUFF. Was it just me that had the heart attack when the quiz mentioned a purging garage sale.... This was a great quiz. I'm a Creative Mess working towards getting my crafting supplies more organised as well as books and nursing study papers its an ongoing process to keep on top of it all.Helps to see many more have this challenge too. i am a creative mess!!!! been like this forever and i love it! lol i now have 6 daughters and they do the same thing,only 1 daughter is messier than the rest-i love it!!!!!!!! from making handmade clothing to the tiniest handmade cards for mommy/daddys with glitter and tons of glue i wouldn't trade any of it for one moment. I got a score of 18...I TOLD my sister and my daughter I was NOT a hoarder and I was right! I may have a lot of supplies, but they are semi organized and I pump out a lot of gifts, crafts and sellable items. I will admit to "boarderline hoarder", but I refuse to go over the edge! 22 and proud of it! I had ALL A's....and saw myself in each question/category. Hahahaha,and I have been told about intervention on many occasions! Proud to be a Craft Hoarder! I'm not doubt a hoarder but a creative mess. I'm a creative mess. Some of the questions were hard to answer because they didn't apply to me. I do hoard a lot of supplies that I love. This was a fun quiz. I would love to share it on fb. I am definately the hoarder.But I have several excuses. I have been saving up for about 29 years until I could retire. I had to buy the stuff while I still had the money. Number 2, I have too many different hobbies. Therefore I need all kinds of supplies. Number 3 I used to sell my finished things and give them as presents. I have no place to sell any longer.I am sad to say I am 66 and most of my family that would appreciate these are are no longer with us.My favorite Aunt is selling all her craft hoard because she and her Hubby are moving into a tieny tiny place for the eldery.Thank God my hubby understands my passion. I appologized one day to him for all the dolls I make and dress and told him I don't know why I have to make and dress them. He said I understand. It is no different than making miniatures. I was very suprized by his answer. I also quilt, Make clothes, curtains,wooden furniture,scrapbooks,Christmas crafts, etc. I really want to make glitter houses. (when I make time between everything else) I have no Idea where I,ll put them though. Craft on ladies and gentilemen. It is good for the soul. 24-surprising too! My daughter calls my little storage space my craft store.you can usually find anything you are looking for and if it's paper I bet I have as much as any big box store! I got 19. I am surprised it wasn't hgher, lol. I do save odds and ends for crafting.. and I like to obtain lots of new supplies whenever I can. I wish I had a dedicated craft room. I try hard to keep everything neatly organized and it's only when I am doing a project that I get a huge mess. Someone commented that crafting is a great stress reliever and I agree. I also can relate to moving and the man having to haul heavy boxes of books. My guy has learned not to complain, lol. He has his own video game hoard that I put up with. compromise is nice. :) He lets me get crafting supplies and he can get games. Win-win. I am a creative mess at 22! This was fun. my paper collection became my next obsession after fabric, but now when I make a card I choose whether the recipient is worthy of Tim Holtz paper or not. Cherish my card and you might get the good stuff!